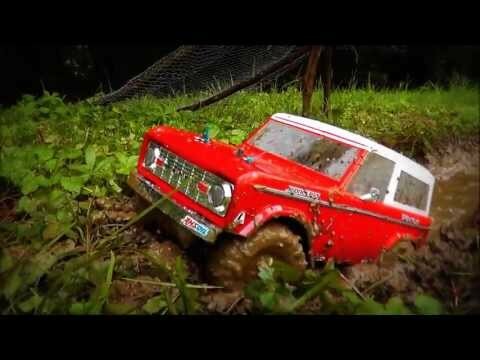 The Tamiya 1/10 Ford Bronco 1973 CC-01 is an rc radio control off road truck kit. It requires painting and assembly to complete it. The Ford Bronco is a famous American 4X4 off-road vehicle. This 1970's model was among the first series called "Early Bronco" which were produced during 1965-1977. Three types of bodies were released; the fully-open "Roadster," the single cabin pick-up "Utility," and the "Wagon" which had a resin roof. The body featured triangular protrusions on both sides on the curved front hood which worked well as a guide for drivers to accurately measure the body size while driving. The front suspension features coil springs combined with the rigid axle, which was a first for mass-produced 4X4 vehicles and works well both on-road and off-road. The Bronco is still greatly popular around the world, particularly in America, where many are used as cross-country and rock crawling vehicles.